STORY: The eighth international sand art festival came to an end in India’s eastern Konark town with visitors thronging the festival on the last day to see sand art by artists from across the globe. 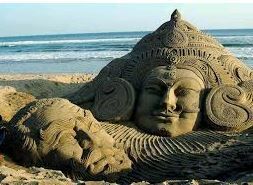 The well-carved sand sculptures made by the participants drew a huge number of visitors to Chandrabhaga Beach. Over 100 artists from United States, Japan, Spain and Sri Lanka participated in the festival which was jointly organised by Odisha Tourism department and Guru Kelu Charan Mohapatra Odissi Research Centre. During the five-day festival, sand arts on the ongoing Men’s Hockey World Cup and sand sculptures showing cultures of various countries and states were on display. A visitor Asha said she was very impressed with the beautifully-made sand sculptures. Renowned Indian sand artist Sudarsan Pattnaik and artist from United States Dan Doubleday also made sculptures during the festival.